Is the shield compatible with Raspberry PI 3? Only triggers 2 outputs. It works fine when individual PINs are addressed. Is this a limitation? This is the first shield I have purchased that had no headers to connect it to an arduino. I expected to have to do some soldering, but I didn't expect to have to buy separate headers. I'm sure that is my own fault and I probably could have figured it out if I looked more carefully. But I'm still disappointed. The analogue has an output option, so you can use this as the switching signal to a transistor in-line with the audio signal. Don't forget to ground the unused pins, and I most certainly don't promise a lo-noise result! What on earth ar you using so many channels for? Most mixers have mutes available, so it can't be that. Switch pots are the traditional solution for teaching labs. Are these stackable / daisy-chainable? I want to get MANY inputs into an Arduino - up to 500+. Would something like this make it possible? Or would this just be unreasonably slow (i.e. would it take forever to read all 500 inputs)? You read my mind!! This is what I need to make my arduino controlled, web based fireworks launcher more reliable and compact... uhh.. I mean my model rocket launcher.. :-) Only 3 months to go 'till 4th of July you know!! I doubt it. You might do better looking at the AdaFruit 16-channel servo board which is stackable (each board needs an address setting to distinguish it from the rest of the stack, done by binary shorting pins on the board). I totally agree with the safety concern, but I handled it differently. I chose to control the igniters with relays attached to my shift registers. They are controlling a 12v supply to the igniters. I installed a Key Switch in front of the common supply that runs to the igniters. The safety rule is no one approaches the tubes without the key in their pocket. That way we know there is no chance of an accidental ignition. Everyone feels safer when the machine is incapable of lighting the shells(disarmed) while the tubes are still being loaded. Even if a shift register got damaged and fired one early, no one would be near it. I'm sure I had a bad connection somewhere, but it will definitely be easier to find if I simplify.. I wanted to use this multiplexer to control a few servos at a time and there was a lot of stuff on the web saying that it couldn't be done. The code below is for two servos. I've combined Adafruit Softservo with the mux shield code. If you have any improvements, please post here. Here is a video of it controlling 21 servos. 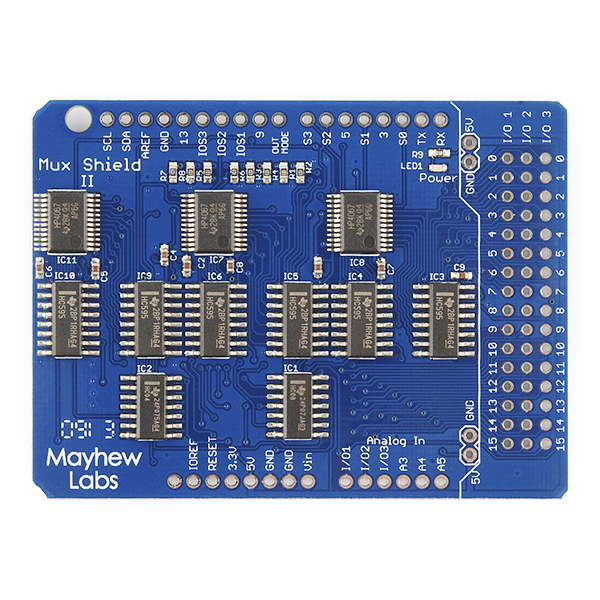 MuxShield.cpp - Library for using Mayhew Labs' Mux Shield. Created by Mark Mayhew, December 29, 2012. This is an ultra simple software servo driver. 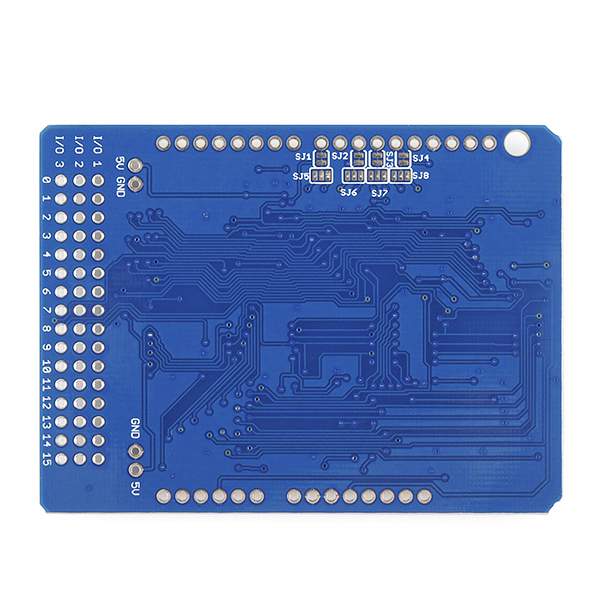 Can this be use with the arduino mega 2560 r3 and if yes how many analog ports would it have then? I am using it for 48 analog inputs, and you must ground all unused inputs or they will transmit meaningless data. simply put a resistor between "I/O x" (x could be 1 ,2,3, depending on which row of pins you are working) and ground could remove all meaningless data in the empty pins. 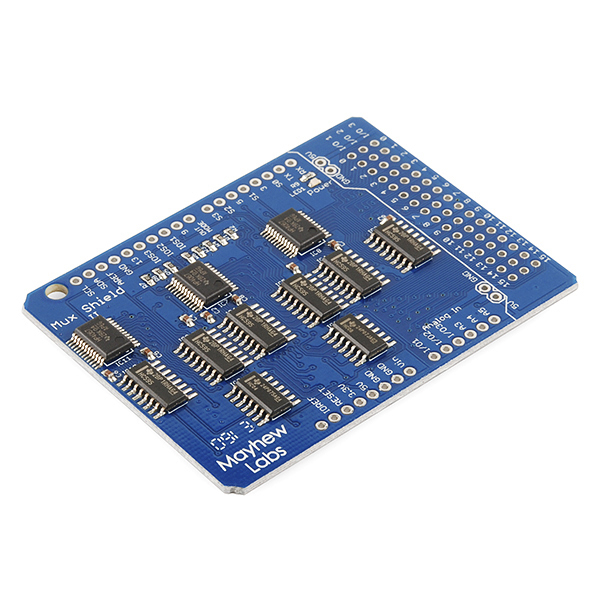 Does anyone know if the arduino Library works with the Mux Shield Version One. I am having trouble running the digital example on my Leonardo. The analog example works fine but digital input does not show any change when the button is pressed. I have the Ground and I/O connected to a button. Am I missing something other then a button? I also tried to connect the 5v and I/O to the button still no change. Can anyone tell me when to use a shift register and when to use a MUX? I think I understand how they both work. It seems to me that a MUX is faster and better for most purposes. To simplify, use a shift register for digital, and a mux for analog. How much current can each output support? I'm in a position where I need just a few more inputs. I'm building a midi xylophone and I want at least 4 octaves, which would use all 48 inputs, but I need some control components as well (octave shift, modulation, etc). Is there any alternative to this that I can use, or something I can add to this? 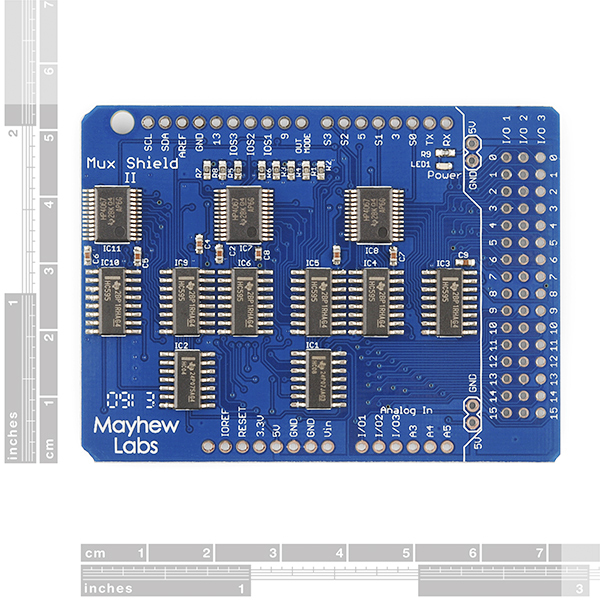 Worth to mention The Mux Shield uses Arduino digital pins 2, 4, 6, 7, analog input pins A0, A1, A2, and optionally uses digital pins 8, 10, 11, 12. This will compact my DCPU-16-on-Arduino w/30-pin RAM down from a Mega to a regular Uno or Leonardo. Nice! All CMOS devices are type HC, not HCT, so 3.3V control signals would be near the minimum spec value for recognition as a logic "1". It would probably work, but temperature and unit-unit variations could cause mysterious errors over a population. I believe you made it just for me! I am a model railroader. My system has 16 turnouts and 23 Occupancy detectors. I have a panel with 16 toggle switches. 16 inputs from toggle switches, 16 outputs to control turnouts and 16 of 23 analog inputs from occupancy detectors! The only thing better would to have 7 more circuits. However I cut down a bit using serial shift registers for some things. Truly a wonderful addition to my electronics. very nice board with an attractive Price. It is working very well.